Below are common attributes associated to East Indian Holly Fern. Become a care taker for East Indian Holly Fern! Below are member comments regarding how to plant East Indian Holly Fern. No comments have been posted regarding how to plant East Indian Holly Fern. Be the first! Do you know how to plant East Indian Holly Fern? Below are member comments regarding how to prune East Indian Holly Fern. No comments have been posted regarding how to prune East Indian Holly Fern. Be the first! Do you know how to prune East Indian Holly Fern? Below are member comments regarding how to fertilize East Indian Holly Fern. No comments have been posted regarding how to fertilize East Indian Holly Fern. Be the first! 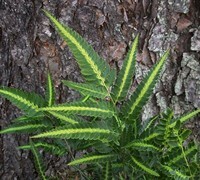 Do you know how to fertlize and water East Indian Holly Fern? Below are member comments regarding how to deal with East Indian Holly Fern's pests and problems. No comments have been posted regarding how to deal with East Indian Holly Fern's pests and problems. Be the first! Do you know how to deal with pests and problems with East Indian Holly Fern? Looking for East Indian Holly Fern? Get East Indian Holly Fern fresh and large directly from the grower to your garden! Buy East Indian Holly Fern online from the nursery wholesalers and save BIG! Plant East Indian Holly Fern in beds that provide well-drained soil and mostly shade. Morning sun is fine. Most all perennial ferns like humus-rich soil so, if your soil is poor, add some organic matter to the backfill mixture when planting. East Indian Holly Fern is an evergreen perennial fern that doesn't require much pruning. Maybe once a year, usually in late winter or early spring, before new growth emerges, you can clean out discolored or dead fronds. That's about it. When planted in good, humus-rich soil that contains organic matter, East Indian Holly Fern doesn't require much fertilizer. I usually apply a mild organic plant food in spring right after new growth begins to emerge. If the foliage turns light green, you can apply sulfur or iron to green it up. I have yet to see any serious pest or disease problems with Autumn Fern. Deer don't bother this perennial fern. Plant in well-drained soils as consistently wet soils can cause problems with the roots.